See Our Amazing Looks Model Contest Entries! Submissions for the 2018 Amazing Looks Model Contest are now closed, but you can see ALL the entries now by clicking the button below, and STAY TUNED ... a winner will be announced soon! Get Ready ... The Amazing Looks Model Contest is Coming Soon! The votes are in! We're proud to announce the 2016 winners of The Goodwill Amazing Looks Model Contest! The winners will participate in our annual Amazing Looks photo shoot this summer where they will be pampered for the day and showcase our fantastic Goodwill fashions selected by our Goodwill Fashion Expert,Bjorn Nasett. The photos will be highlighted on the Amazing Looks section of this website, as well as used throughout the year in various online promotions. The Goodwill Amazing Looks Model Contest is Coming Soon! Our Amazing Looks Model Contest is back! You already shop and donate to Goodwill; now is your chance to model the great fashions you can find there, on the Amazing Looks section of our website! Think you’ve got what it takes? Then get ready to strike a pose! Meet Our Amazing Looks Model Contest Winners! Our Amazing Looks model search is complete! Our 2015 winners are Jay and Melissa! Congratulations to the Amazing Looks Model Contest Winners! Fashion Expert Bjorn has selected the winners of our Amazing Looks Model Contest! Congratulations to our Winner Hayley D., and congratulations to Jeff J. for being named Runner Up! 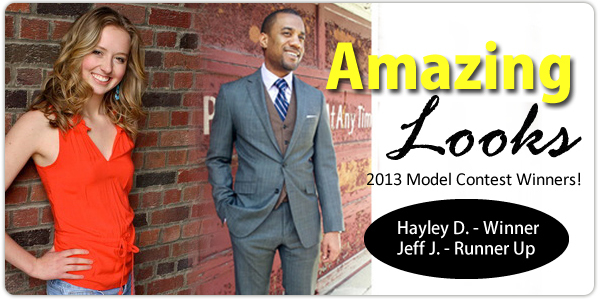 Both Hayley and Jeff will attend our Amazing Looks photo shoot, model Goodwill fashions and be featured in our Amazing Looks section! Congratulations to the Top 6 Finalists in our Amazing Looks Model Contest; Hayley D., Rachel M., Jeff J., Lynne B., Lori R. and Madeline S.! We had a tie for the fifth finalist, so six contestants will move onto the final round, where Fashion Expert Bjorn will decide the winner - stay tuned for that announcement after Memorial Day!